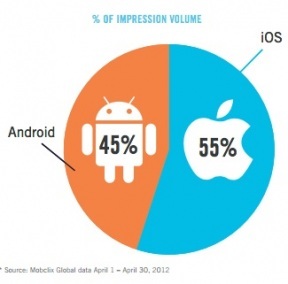 Last month, mobile marketing company Velti reported that iOS had pulled slightly ahead of Android in mobile ad impressions, after being tied at the end of last year. Now, apparently, iOS has taken widened that lead, if not by much — it accounted for 55 percent of mobile ad impressions in April, compared to 45 percent for Android. The data is based on data from Velti’s Mobclix Exchange, which serves ads to more than 33,500 apps, the company says. But not everything looks rosy for Apple. The report also says that impressions from the new iPad, which exploded out of the gate in March, had also slowed compared to the growth of the iPad 2 after its launch. The new iPad currently accounts for 8 percent of all impressions, while the iPad 2 had 13 percent at the same point in its release cycle. Or if you want things broken down by carrier, AT&T is dominant, with 53 percent of impressions, compared to 24 percent for Verizon and 19 percent for sprint. Finally, the report breaks down CPMs by advertising category. Women/mothers was the most lucrative category, with CPMs of $15.15, followed by finance ($10.21) and automotive ($9.51).